Eye On Sports Media: Sports Media Best Practices: How Do You Market Your Brand Where It Does Not Show? Sports Media Best Practices: How Do You Market Your Brand Where It Does Not Show? The days of broadcast networks owning their own fleet of mobile production units. A long time ago, they outsourced this capital equipment. But there is a downside to that. 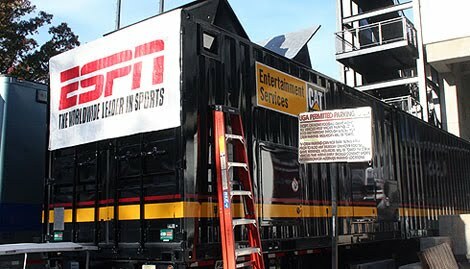 When CBS Sports, Fox Sports, and ESPN are covering games, people walking by the truck "compounds" do not know, or may not know, who they are. 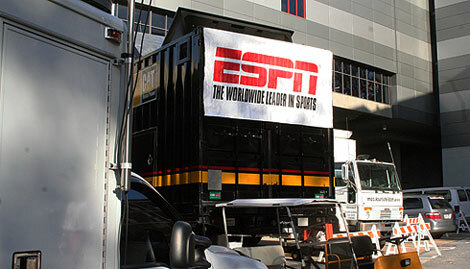 So how does a sports network overcome the lack of branding? The answer is actually very simple, and was done by a creative ESPN crew this weekend in Athens, Georgia. Just take one of the network "banners" and tie it to the back of one of the trucks. Of course, some regional networks have paper banners, so it might not work as well. But what the ESPN crew did above is a simple, cost effective way to expand your brand presence so people know who you are. It does not matter who owns the actual trucks.